When your industrial facility or warehouse has roof leaks, you can turn to Choice Roof Contractor Group™ for lasting, effective solutions. Our nationwide network of professionals proudly offers a full range of industrial roofing services across the United States. These qualified experts will work hard to save you time and money with dedicated customer service you’ll notice from our first contact! We are focused on your complete satisfaction, and our group of quality-minded contractors will ensure your needs are met with professionalism, attention to detail, and efficiency. You can count on the resources of our nationwide network to address any large-scale industrial roofing needs in the timetable you need, as well. What size is the roof ? When do you need service ? Choice Roof Contractors are factory-trained in all products lines offered by the Conklin Company, a leading building products manufacturer for 35+ years. Conklin roofing products have been installed on more than 2 billion square feet nationwide. And many original Conklin roof systems installed back in the 1970s are reportedly performing today. Most industrial buildings have low slope or flat roof systems for their protection. Our Conklin products are engineered for the specific needs of these architectural designs. With these products’ seamless, elastomeric, watertight membrane, your industrial roof will no longer have any problems with leaks. Plus you can save as much as 30-50% on annual cooling costs with a white, reflective surface. If you’re the manager of an industrial facility or warehouse, you rely upon your building and equipment for meeting customer demands and production schedules. A leaky roof can not only disrupt plant scheduling, but also impact the bottom line. 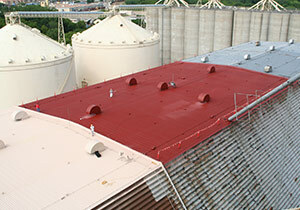 A full range of roofing applications are available for any size of industrial facility. We offer durable single-ply roofing for new installs and re-roofing applications, and thick, reflective roof coatings for cost-saving roof repair and restoration needs. Conklin roof system installations are often backed by non-prorated warranties on 100% of labor and material costs. These non-prorated guarantees last for up to 20 years, and they can be renewed with a timely product reapplication on your industrial roof. Once your roof repair, restoration, or replacement needs are handled, your industrial roof must have ongoing caretaking. You can keep your facility operations running smoothly and keep costly leaks at bay with routine roof maintenance programs. 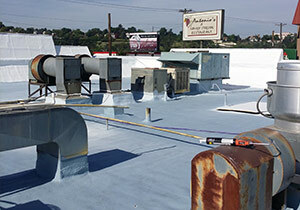 Our nationwide network of professionals offers industrial roof maintenance services. If you have many roof assets to manage in multiple locations, Choice Roof Contractors also provide their clientele with comprehensive roof asset management programs. Don’t settle for roofing services that won’t match your timeframe or servicing from contractors without project management skills. You can trust our skilled roofing experts to handle your specific project requirements in a timely and efficient manner. Learn today about how working with our professionals can give you the results you need. Contact us for a free local quote!